달팽이 점액 여과물과 여러 고농축 추출물 영양성분이 피부집중보습에 도움을 주어 촉촉하고 건강한 피부로 가꾸어 줍니다. [효능/효과] 피부 미백에 도움을 줍니다. 주름개선에 도움을 줍니다. [용법/용량] 본품 적당량을 취해 고르게 펴 바릅니다. 세안 후 기초케어 마지막 단계에서 본 품을 적당량 덜어 얼굴 전체에 골고루 펴 바른 뒤 피부결을 따라 가볍게 두드려 흡수시켜 줍니다. Sferangs' intensive repairing mucin cream contains wild snail sticky mucus that helps restore natural tone, elasticity and firm for a more youthful appearance. 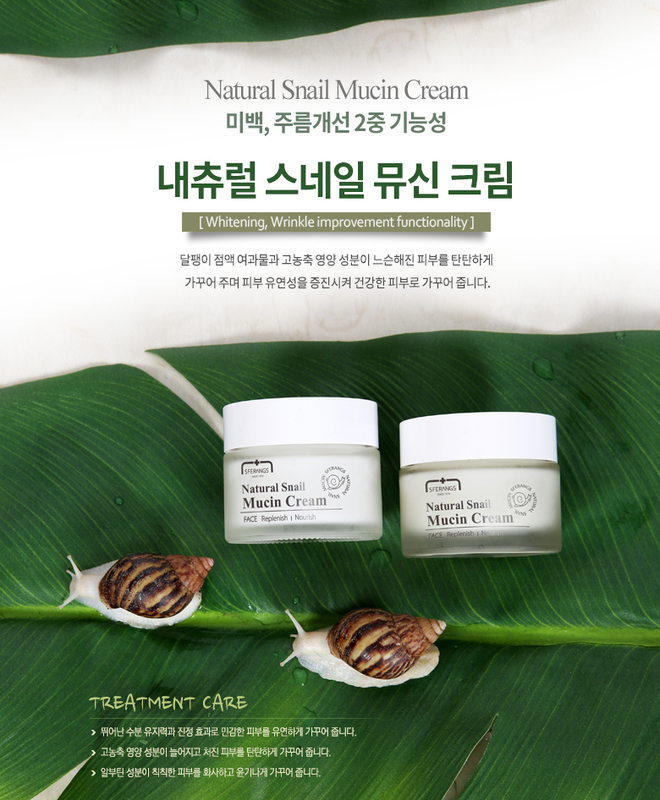 DIRECTIONS : Use every morning and night after natural snail mucin ampoule.